A family of four is about to get a rare look into America’s space-exploration HQ, NASA Space Center Houston. NASA and Walden Media launched the exclusive Totally Cosmic Adventure at NASA Sweepstakes. 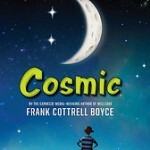 The two-day, behind-the-scenes tour of NASA coincides with the launch of Cosmic, an “out of this world adventure novel by Frank Cottrell Boyce. The winning family will get a VIP tour of Space Center Houston, including the astronaut training areas, the astronaut cafeteria, space vehicle mock-up facility, new mission control center, historic mission control center and other unique space environment training facilities, simulators and research laboratories. Sweepstakes entries will be accepted from January through February 23, 2010, at the HarperCollins Children’s Books website. Contest to Win a Copy of Cosmic, starting soon!